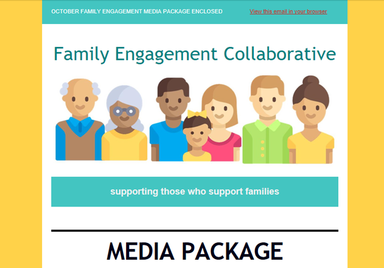 We have designed this "Family Engagement Media Package" to help institutions help their families. We have gathered information by interviewing local families to find out what information and tools they want and need. We then organized these tools and resources into social media formats, as well as other tips and research-based articles to make it easier for you to communicate with your families. We will include a list of specific TWEETS, FACEBOOK POSTS and an EMAIL/BLOG article each month for you to easily COPY, PASTE and FORWARD to your school family. We wish to make it simple and easy to communicate with your families through the ever so popular social media channel. Don't use social media? No problem! Use this information or any of the other helpful resources on this monthly email in any way that you wish. There is something for everyone!!! Please be sure to check out our exciting and new "Miami Valley Family Community Calendar" and "Miami Valley Community Resource" page. We have provided the tools to help you help families and increase family engagement overall in our community. We are here to support those who support families.